Cucumber Vegetable - Cucumber belongs to the family of the Cucurbitaceae family and is scientifically called Cucumis sativus. Cucumbers originated in India, now cultivated in many countries. Different varieties of cucumbers available in market include slicing, pickling, and seedless. Slicing cucumbers are consumed freshly; Gherkin cucumbers are used specially in pickles. Seedless cucumbers are grown in greenhouse, also known as “burpless”. It is easier to digest than other cucumbers which is why this variety is devoured by many people. Cucumbers are usually cylindrical in shape and vary in length from about six to nine inches and vary in color from green to white. Cucumbers are available in year around. Its high beneficial nutrients help to treat and prevent some diseases. Its low calories make it good choice for weight loss and its high-water content helps keep your body hydrated. So many people include cucumber in their diets. Cucumber is packed with vitamin, Minerals, carbohydrates, proteins, antioxidants. Here below listed are the nutrition value per 100 grams (3.5 Oz) and the percentage of RDA (Recommended Dietary Allowance). Cucumber is helpful in protecting human body from constipation because it contains low amount of calories and high amount fiber. Regular intake of food rich in fiber helps to prevent constipation. Cucumber contains good amount of fiber, which helps to prevents digestive problems like heartburn, acidity, gastritis, and ulcers. Fresh cucumbers are advantageous for diabetes. It helps generate hormones that are required by the pancreas for producing insulin. Therefore consumption of cucumber keeps the glucose level in check. Cucumber vegetable helps reduce the risk of various cancers. Polyphenols called lignans (pinoresinol, lariciresinol, and secoisolariciresinol) are present in cucumber which may help to lower the risk of breast, uterine, ovarian, and prostate cancers. Cucumber vegetable contains beta-carotene; it is acts like an anti-oxidant, which is help to fight free radicals and controls damage. Flavonoids present in cucumber help to reduce internal inflammation. Cucumber is very low in calories and high in fiber. Fiber causes slow digestion and promotes feelings of fullness for longer time and is one reason why fiber-rich foods may help in weight control by reducing the necessity for frequent intake of food. 95 % of water present in cucumber is naturally purified and thus helps to keep your body hydrated. 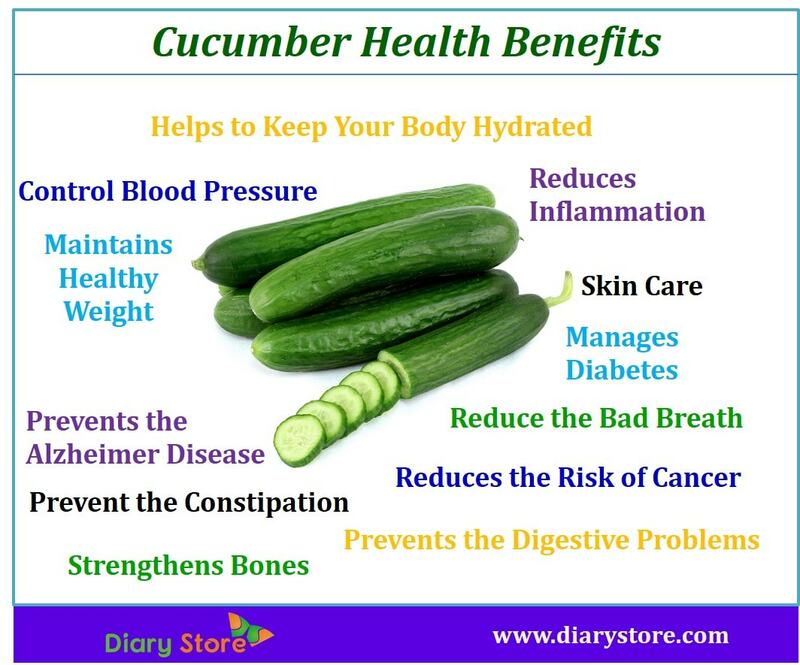 So include cucumber in your diet especially in summer. Cucumber vegetable releases phytochemicals that kill the bad breath causing bacteria that cause bad breath. Regular intake of cucumber helps to release excess heat in your stomach, which is said to be a primary cause of bad breath. Cucumber contains good amount of silica and great source of water, which help to maintain healthier and brighter skin. Cucumber heals sunburnt skin; it is also used for treating swelling under the eye. It reduces the Dark Circles and helps to toning down of under eye bags. 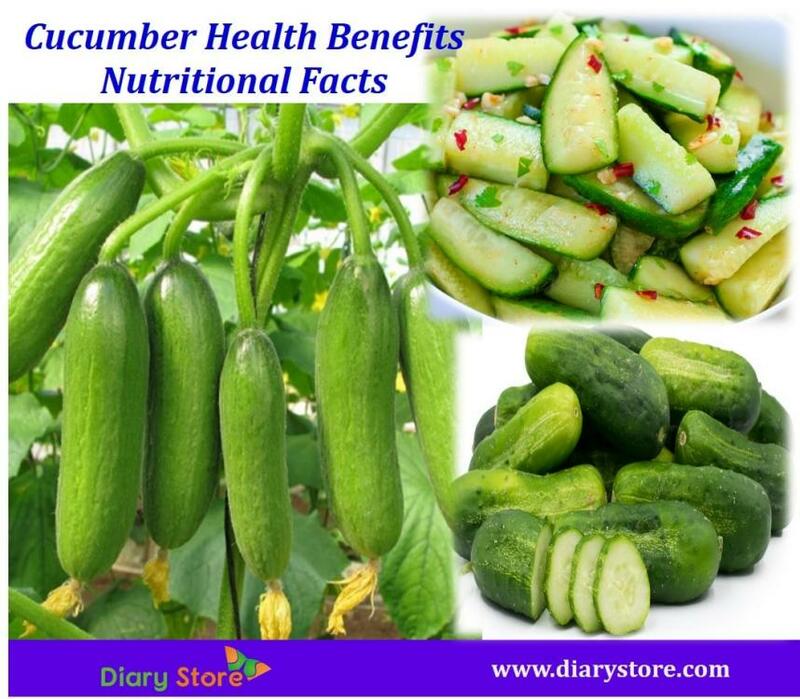 Cucumber has good amount of vitamin K, which plays an important role in strengthening bones. It also contains silica, which helps promote healthy joints. Thus cucumber is ideal for strengthening bones. A flavonoid called fisetin is present in cucumber which plays an important role in proper functioning of brain. It enhances cognitive abilities, thereby delaying the onset of Alzheimer’s disease.